The last few dollars of student fees are being spent as the year comes to a close. If you’re wondering what they are being spent on, the person to ask is Michelle Smith. As the vice president of finances, she is the one who accounts for every penny spent. For the past year, Smith has been responsible for maintaining the budget for ASCEU. Her job is to know where and how much is being spent in the different areas such as activities and academics. 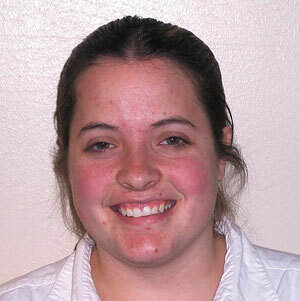 She is also in charge of the Student Fee Allocation Committee, more commonly known as SVAC. Next year an added responsibility includes management of finances for the gameroom, super activities, activity card and recognition. Smith feels that two of the major accomplishments she has been able to help accomplish have been SVAC and being able to, “focus student fees to where they’re supposed to be.” They are now better organized and things will be able to run more smoothly in the future. When questioned about the faculty, Smith was very positive saying that most are willing to do what is necessary to best serve the students, and enjoyed working with them. She commented that the faculty always stressed communication, which helped to get things done.